In the last decade, zombie literature has become mainstream. The success of Max Brooks’s World War Z and Brian Keene’s The Rising has led to a proliferation of novels featuring the walking dead to meet the public demand. Among the writers focusing on this subgenre of horror is Joe McKinney with his Dead Lands and Dead World series. 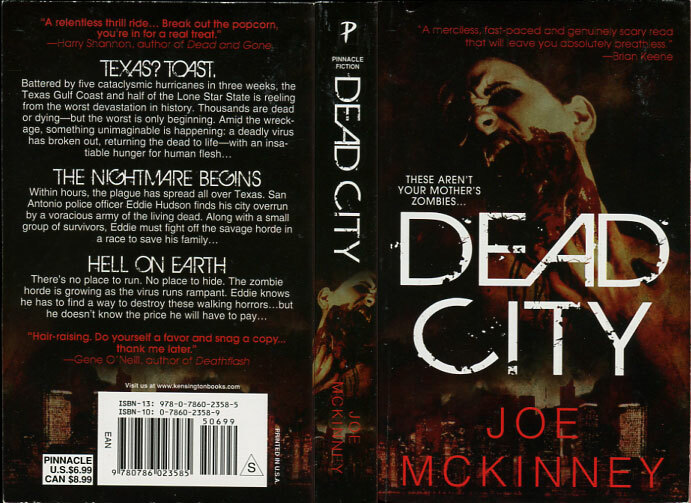 Dead City is the first novel in the Dead World franchise. It follows Police Officer Eddie Hudson of San Antonio, Texas –a character similar to Officer Rick Grimes of Robert Kirkman’s The Walking Dead (yes the tv series source)- dealing with a zombie outbreak. Like Valve’s Left 4 Dead computer games, the zombies include both slow moving walkers and fast moving runners. The plague spreads from Houston, where a series of hurricanes have wreaked havoc on the city causing a Katrina-esque tragedy. McKinney rigorously adheres to the predictable. In doing so, he creates a formulaic narrative which centers on the protagonist struggling to survive the first night of the outbreak, similar to George R. Romero’s Night of the Living Dead. However, this is not necessarily a failing. It is clear McKinney has studied both the classics and what has made the recent wave of literature so successful. He even manages to capture the internet fandom debates which surround the subgenre. The problem is that Dead City never does more than explore the world. Characters come and go without much purpose and do not stay long enough for the reader to get attached. Officer Hudson simply lumbers from place to place without much reason other than a desire to find his wife. Then, it abruptly ends. There is never any climax to his adventure. Rather, it feels like the end of the world is just beginning. Dead City has the expected action sequences and character interactions, but it does nothing to move the subgenre forward. Fans of zombie literature craving more of the same will not be disappointed. Yet, those wishing for something new will not find here.